You read that right, True Believer. Once is never enough, and the Merc With a Mouth is back to cut a bloody swath through the Marvel Universe’s greatest champions! It’s one of the best-selling Marvel collections of all time, and this July it’s back for another go around. 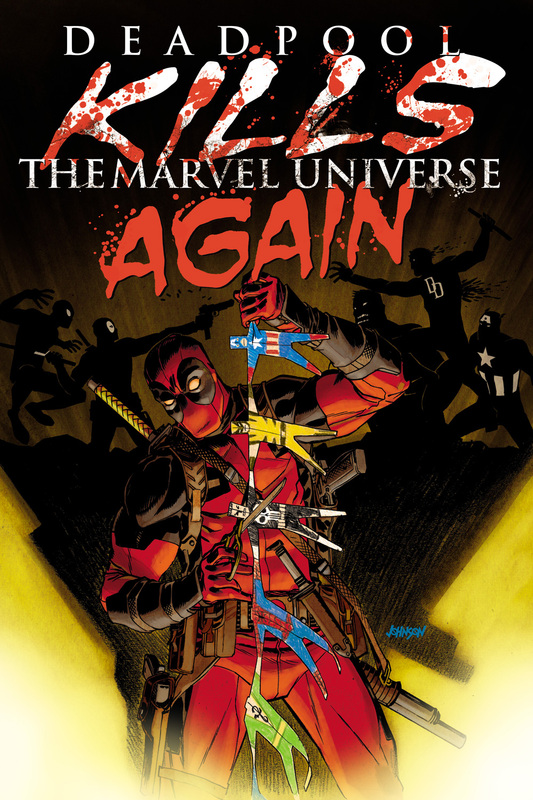 Reuniting the original creative team that started it all, Cullen Bunn and Dalibor Talajic proudly (and violently) bring to you…DEADPOOL KILLS THE MARVEL UNIVERSE AGAIN #1 – an all-new 5-issue series! Remember the time Deadpool went a little TOO crazy and killed the entire Marvel Universe? Well, this isn’t that. This is a DIFFERENT time Deadpool went a little too crazy and killed the entire Marvel Universe. So strap in, because the Merc With a Mouth is taking out all of your favorites in the most horrific ways possible. Heroes. Villains. It doesn’t matter to Deadpool one bit! But trust us, it’s going to hurt him more than it hurts you…and you’re going to love it! The carnage and the mayhem kick off this July. Be there for a murderous rampage unlike any other, when DEADPOOL KILLS THE MARVEL UNIVERSE AGAIN – coming to your local comic shops and on digital devices everywhere!